A true spiritual teacher does not have anything to teach in the conventional sense of the word, does not have anything to give or add to you, such as new information, beliefs, or rules of conduct. The only function of such a teacher is to help you remove that which separates you from the truth of who you already are and what you already know in the depth of your being. The spiritual teacher is there to uncover and reveal to you that dimension of the inner depth that is also peace. If you come to a spiritual teacher — or this book — looking for stimulating ideas, theories, beliefs, intellectual discussions, then you will be disappointed. In other words, if you are looking for food for thought, you won’t find it, and you will miss the very essence of the teaching, the essence of this book, which is not in the words but within yourself. It is good to remember that, as you read. The words are no more than signposts. That to which they point is not to be found within the realm of thought, but a dimension within yourself that is deeper and infinitely vaster than thought. A vibrantly alive peace is one of the characteristics of that dimension, so whenever you feel inner peace arising as read, the book is doing its work and fulfilling its function as your teacher: it is reminding you of who you are and pointing the way back home. This is not a book to be read from cover to cover and then put away. Live with it. Pick it up frequently, and, more importantly, put it down frequently, or spend more time holding it than reading it. Many readers will feel naturally inclined to stop reading after each entry, to pause, reflect, become still. It is always more helpful and more important to stop reading than to continue reading. Allow the book to do its work, to awaken you from the old groves of your repetitive and conditioned thinking. The form of this book can be seen as a revival for the present age of the oldest form of recorded spiritual teachings: the sutras of ancient India. Sutras are powerful pointers to the truth in the form of aphorisms or short sayings with little conceptual elaboration. The Vedas and Upanishads are the early sacred teachings recorded in the form of sutras, as are the words of the Buddha. The sayings and parables of Jesus, too, when taken out of their narrative context could be regarded as sutras, as well as the profound teachings contained in the Tao Te Ching, the ancient Chinese book of wisdom. The advantage of the sutra form lies in its brevity. It does not engage the thinking mind more than is necessary. What it doesn’t say — but only points to — is more important than what it says. The sutra-like character of the writings in this book is particularly marked in chapter 1, (“Silence and Stillness”), which contains only the briefest of entries. This chapter contains the essence of the entire book and may be all that some readers require. The other chapters are there for those who need a few more signposts. This book, of course, uses words that in the act of reading become thoughts in your mind. But those are not ordinary thoughts — repetitive, noisy, self-serving, clamoring for attention. 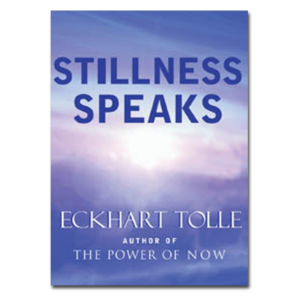 Just like every true spiritual teacher, just like the ancient sutras, the thoughts within this book don’t say, “Look at me”, but “Look beyond me.” Because the thoughts came out of stillness, they have power — the power to take you back into the same stillness from which they arose. That stillness is also inner peace, and that stillness and peace is the essence of your Being. It is inner stillness that will save and transform the world.